Like many of you, there are recipes that I practically grew up on. Ones that my mom made for certain occasions, and that envelope me in warmth and coziness whenever I eat them now. These barbecued beans are one of those recipes. When I was younger, my parents would host an annual New Year’s Eve party at our house. When they first started, my sister and I were in grade school, and all the kids of my parents’ friends would come along, and we would play in the basement (Roller Racers, anyone?) while the adults had their party upstairs. As we got older, we started inviting our own friends, having our own mini parties. One year in high school it was even warm enough (in the 60’s in Pittsburgh – unheard of!) to play basketball out back. While we got older and the faces of those that came to the parties changed, one of the constants on New Year’s Eve was this bean dish. Served alongside other staples such as pork and sauerkraut, it just wouldn’t be New Year’s Eve without it. It isn’t made nearly as often nowadays, so I savor it whenever I get the chance! 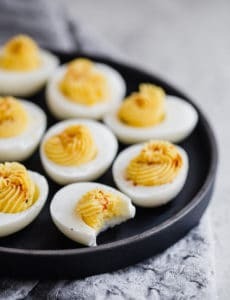 I labeled this a side dish because it is great on a buffet with a collection of other dishes, and as you can see, it went great with burgers and coleslaw for Father’s Day as well (although it does also have ground beef in it, so a tad redundant, but I’d never turn it down!). I actually think that this would be a perfect thing to make for football Sundays (or Saturdays, for you college fans) – you can make a big pot and let it stay warm all day! This is an old recipe that my mom got from a crock-pot recipe book back when my parents first got married, and it has certainly stood the test of time. Do you have any favorite food traditions from when you were younger? 1. Brown ground beef in a skillet over medium heat, stirring until crumbly; drain. 2. In the same skillet, saute the bacon and onion over medium heat until bacon is cooked and onion is browned; drain. 3. Combine the cooked ground beef, bacon, and onion with the remaining ingredients in a crock-pot, mixing well. Cook on low for 4 to 6 hours. * Note: If you don't have a crock-pot or slow cooker you could also combine the ingredients in a Dutch oven and cook on the stovetop over low heat or in a 300 degree F oven for the specified time, checking on it and stirring occasionally. These bean look FANTASTIC! I can’t wait to try them out! Thanks for sharing! If I do a review on my blog, I’ll come back & let you know about it. mmmmmmm, fantastic! I did leave out the ground beef (we had grilled steaks, thought it was overkill!) but the taste and texture was wonderful, just the same. Had some cold leftovers for breakfast, lol. Thanks for the recipe! Made these yesterday and they were awesome. I like food with a little kick, so the only thing i added was some crushed red pepper flakes to kick it up a little. Not too much, just enough to add some heat. Hi Brandon, So glad you enjoyed these, I love the addition of the red pepper flakes! Wow…. It’s like you were reading my mind. My mom used to make these for every summer holiday party, and I’ve always loved them. 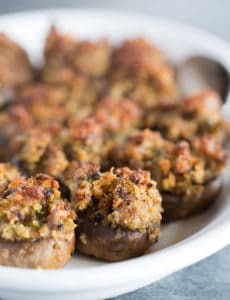 I was just saying the other day how I wish i had the recipe, because I’ve been craving them. Now they will grace our table on July 4th! Thank you!!! What a great side dish to serve during the summer! Thanks for sharing your mom’s recipe! My childhood favorite: my mom’s spaghetti. To me, there’s nothing like it in the world. My stomach is grumbling…because of seeing these beans! Thanks so much for the recipe (sometimes I like to mix in some non-sweets :) ). i have a love-hate relationship with bbq beans, but i can tell these would be a LOOOOOOOOVE relationship! homemade is always better! UNcanny. I made these yesterday!! I had never had them until my mother-in-law made them for Mother’s Day, and I nearly ate the whole pot. She calls them calico beans. I love recipes that remind me of home, like crumble or roast dinner. This has got me all nostalgic for home! Love it! I’ve rediscovered my crock pot as a summer cooking option and love the idea of grill/crock pot meals. 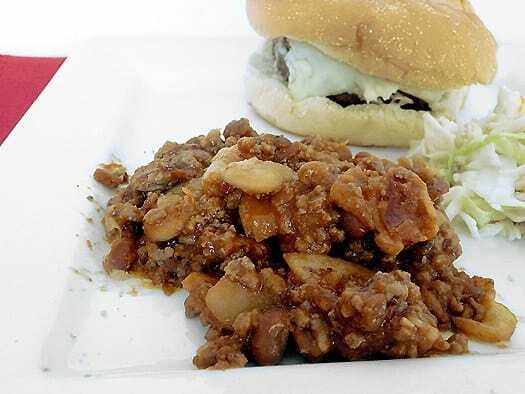 What a great recipe, this is the first time I have heard of adding ground beef to a baked bean recipe. It looks so good I will be trying this recipe and keeping it for future gatherings, thanks! Speaking of New Year’s Eve , we also always had house parties , same as your family adults upstairs ,kids in the gameroom[now called the family room] . We always had the New Year’s pretzel .I now live near the Poconos and up here they have no clue what that is . I’m still looking for a recipe for one . Do you have one to share ?I would be so happy !! What an awesome summer side dish Michelle! This looks like a whole lotta perfect to me!